Go off the beaten track to see the beauty spots of Tenerife on a full-day 4x4 jeep or minivan tour. 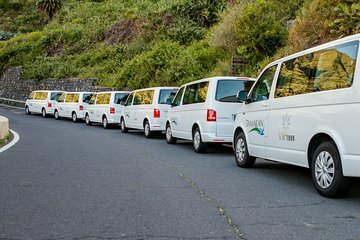 Choose from three routes and hop inside your shared vehicle with a professional driver to discover some of the island’s best scenery, from Mt. Teide and the Orotava Valley to Anaga's laurel forests. Whichever route you select, stop for a typical Canarian lunch along the way. Your tour includes lunch and return hotel transfers. Morning part of the tour wasn't great but the afternoon part made up for this. The tour states that lunch is provided but it wasn't. We stopped for lunch and was told this was extra. When I explained our tour included lunch, the guy said that lots of tour companies add extra things that aren't necessarily included to make the tour sound better!! Lunch was only 9 euros and was worth the money but it was the principle. The tour itself was good and I do not regret doing it but that was not a Jeep Safari but a Minivan Safari. Why not naming things as they are instead of fooling your customers? I would recommend booking the tour at your hotel and not relying on viator.